Knut Ørbeck-Nilssen is the CEO of DNV GL – Maritime and a member of the Executive Board of DNV GL SE. He was appointed CEO in August 2015 and prior to that had been the Chief Operating Officer and President of DNV GL – Maritime. After joining DNV in Oslo, in 1990, as a structural engineer, Knut Ørbeck-Nilssen worked in DNV’s core business areas serving the maritime and oil & gas industries. He undertook many roles in the organization, including project management, across a wide range of technical disciplines and also held a number of management positions. He was also based in Japan for two years. In September 2013, Knut Ørbeck-Nilssen was appointed as Director of Division Europe, Africa & Americas in DNV GL – Maritime, one of two geographic divisions responsible for DNV GL’s core maritime and offshore classification business of DNV GL. For a period, he held both the position of President of DNV GL – Maritime as well as Director of Division Europe, Africa & Americas. 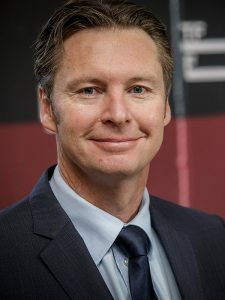 Knut Ørbeck-Nilssen holds a Bachelor of Engineering degree from Heriot-Watt University where he was awarded a First Class Honour’s Degree in Civil Engineering in 1990. In his final year, he was awarded the Watt Club Medal, Heriot-Watt University’s premier award for undergraduate students. He also received an undergraduate degree in Civil Engineering from Oslo Polytechnic in 1987.